Shripad SriVallabh was born in a Brahmin family in a village named Pithapur (East Godavari District in Andhra Pradesh, India). A Brahmin couple Appala Raju Sharma and Sumathi, were devotees of Lord Datta. They had many children of whom only two survived. One was lame and the other was blind. They worshiped Lord Datta and never failed to offer food to mendicants and monks. They looked upon all such as they very forms of Lord Datta. One day, they were performing the annual ceremony in their house and many Brahmins were invited as guests for the feast. Tradition holds that none should eat on that day before these guests partake their food. At that time Lord Dattatreya appeared at their threshold in the form of a renunciate sadhu (saint), bearing the staff and the water-vessel (Kamandalu) and asked for food. The housewife, with immense faith that the visitor was none other than the Lord to whom the whole annual ceremony was being offered, gave Him food even before the Brahmin guests were fed! Her faith touched the Lord’s heart and He at once granted her a vision of this true form. His glorious form had three heads, clad in a tiger’s skin and his body besmeared with sacred ash (vibhuti), he looked like a silver mountain in moonlight. The blessed housewife drank the divine glory of the Lord’s from and felt that the highest object of her birth was fulfilled. The Lord said, “Mother, I am pleased with your devotion. Even before you fed the Brahmin guests, you have given me food with the full faith that this is the Lord in the guise of a holy mendicant. Now, ask me for anything you wish and it shall be granted”. The sight blessed her eyes and now her ears were sanctified by His sweet words. “Lord”, she said, “Lord! You addressed me as mother, please let your word be turned into reality”. Lord replied Tathastu (so be it) and disappeared. Lord Dattatreya, in order to bless his devotees and the righteous ones, wanders about in the guise of a random guest at the lunch hour. That’s why it is said that a random guest has to be treated as the very embodiment of Lord Dattaterya. Then Sumathi told her husband of the Divine vision the Lord had bestowed on her and of his granting her wish for a divine son. Not long after, Sumathi conceived and delivered a male child at the proper time. She gave birth to one who is indeed birth-less. This was no birth in the normal sense, the Lord just manifested Himself as a child in this house. As the child has all the Divine features with celestial radiance, he was fittingly named as Sripaad. This was the first incarnation of Lord Dattatreya. As days and months passed, the child Serenade grew ever more glorious, the age of eight. As per the tradition, he was invested with the sacred thread. Normally, after the sacred thread ceremony a boy has to be trained by a Guru for 8 years before he can memorize the Vedas (external repositories of Spiritual Wisdom) completely. But this boy, Sripaad, started imparting vedic knowledge to this pupil right from the moment of his Upanyana (sacred thread ceremony). It was all a purely Divine miracle. When Sripaad attained marriageable age, He was asked His opinion, “All women in this world are like my mother. I am married to sannyaasa (renunciation). My mission is to give initiation and guidance to sadhus (holy men)”. Speaking thus he sought permission from his parents to become a sannyasi and to leave the house. The parents were loathe to forego such a son. Apart from this the other two children were dumb, deaf and blind. If Sripad left his parents, who will look after them in their old age. Sripaad understood their anxiety. He called these blind and lame brothers, his heart, melting with compassion at the sight of the tears in his parents, Sripaad touched his brothers and made them whole in a moment! What is impossible for the Almighty and the lord of the universe? The miracle dispelled the veil of delusion that blinded their understanding. Then the Lord granted them the vision of His real Divine form. The handsome, tender lad at once appeared radiant like a million suns and pleasing as myriad moons. His blissful nature seemed to enliven every atom of existence. With their permission, He renounced all worldly ties and trekked to several Holy places like Dwaraka, Brindavan, Mathura, and Badrinath. After wandering there for sometime, He marched down to the Holy Gokarna in order to bless the spiritual seekers. 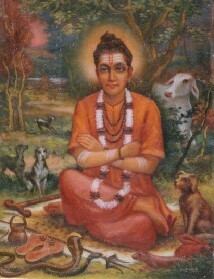 Sripaad lived for three years in Gokarna. Having uplifted several seekers there spiritually, the Lord went to Kurvapur and settled down there. The Lord was moved by compassion at her words and said, ‘Mother, by committing suicide, you only add to your former sins and you will have to suffer more in the next life. Therefore, devote your whole life to the worship of Lord Shiva. You shall be blessed with a noble son in your next life’. The above event was perhaps Shri Guru’s own sankalpa to reincarnate again as Sri Narasimha Saraswati . Therefore He had pre-arranged this leela so as to meet and bless His next incarnation’s mother-to-be. Sripaad Vallabha disappeared one day after entering the Ganges river. Though he is physically no more, devotees ever feel His presence and grace. His divine spirit is ever manifest. The Lord is eternal. As He is the seed of the whole universe, His activities are infinite. So His purposes are infinite. In fact, He is ever in front of His devotees, granting their prayers. Yet he is invisible to all those who are blinded by the spirit of the ‘Kali’ age he has been granting the wishes of his devotees, though he is invisible to them. Shripad SriVallabh can even be seen by those who are pure of heart. That village has become a Holy by His eternal presence.